Does your cute little Maltese puppy or Maltese dog suffer from dog tear stains and you can't figure out why? You may want to blame your Maltese puppy's parents. 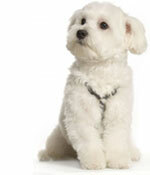 Although most Maltese dogs will experience at least a little eye stain, some Maltese may have it worse than others. Tear staining can be passed down to the next generation. Read below to discover what you can do to lessen the effects of cronic Maltese eye stain. What dog tear stains solution worked for your Maltese? Tell us about it. There is a genetic predisposition toward tear staining. Being selective in Maltese breeding stock can play a significant role in tear staining. Solution - When you are in the process of selecting a Maltese puppy, make sure you view the parents too. If they have heavy tear stains, it is likely that your puppy will too. If you already have a Maltese dog or Maltese puppy with eye stains that are genetic, don't worrry. Just try some of these dog tear stain solutions. 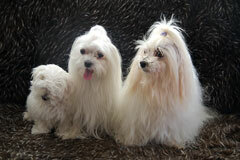 Young Maltese puppies from 5 months to 8 months of age are in the process of getting their adult teeth. This change in mouth structure can sometimes cause the tear ducts to close and tear stains to appear. Solution - Give your Maltese puppy plenty of dog toys to chew on. This will relieve the pressure on her tear ducts and lessen the chance of tear staining. Still have questions about dog tear stains? I've teamed up with a group of expert dog vets to help you find the answer.